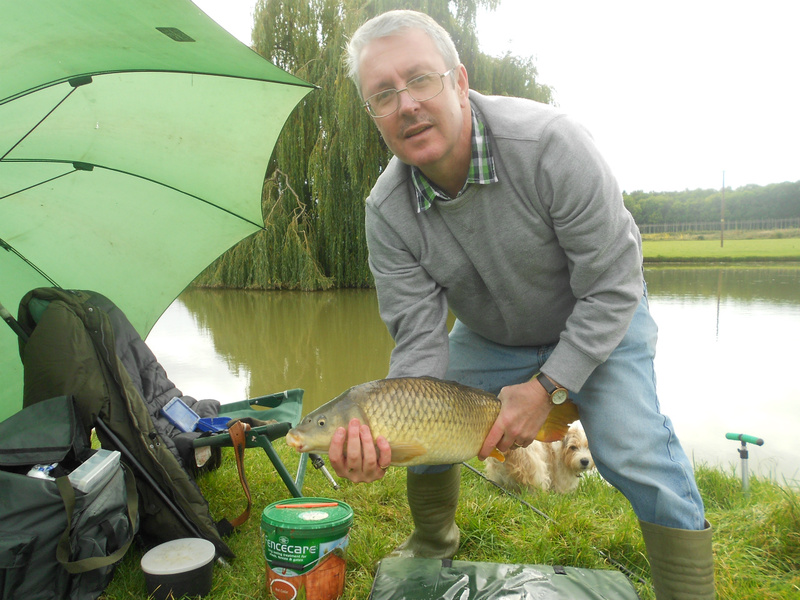 Dave gets among 'em - note the ever present farm dog with carp fixation. He kept us company all day! 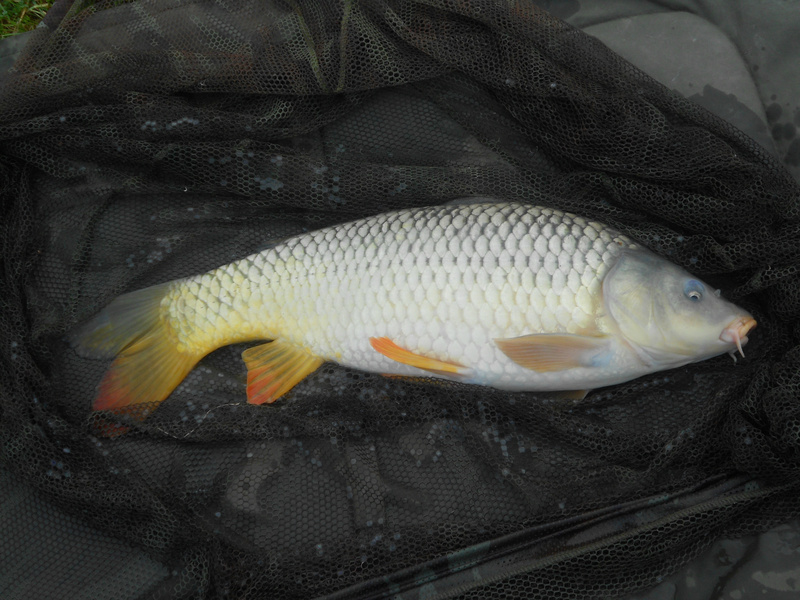 Not a big one, but perhaps the best-looking common of the day - in great condition. Hoveland is something of a hidden gem in my local area - it endures in plain sight, but it is little fished, despite holding a good many double-figure carp, - perhaps to thirty pounds. Fishing with my brother Dave today (October 8, 2016), we started off full of happy expectations, and we were not disappointed. 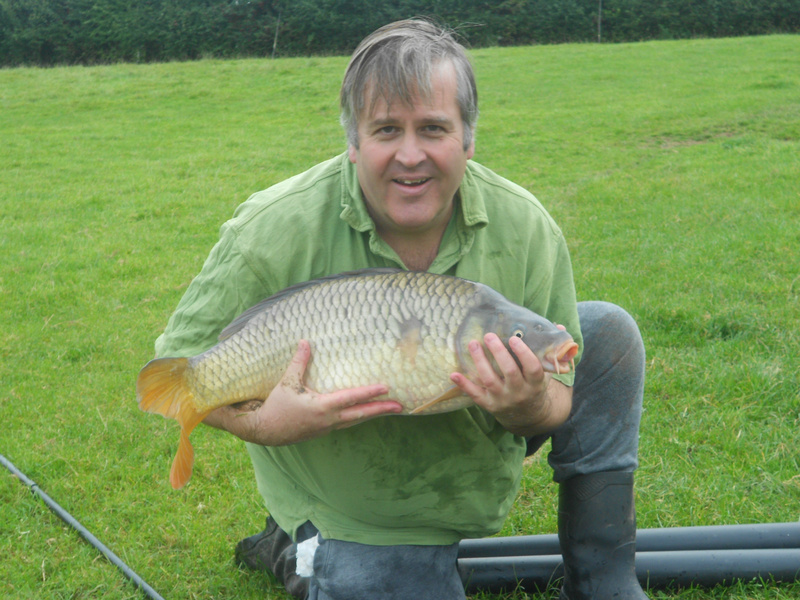 We were soon into fish - I caught eight carp including five doubles, - which is an outrageous result for me during a day session. It wasn't really deserved, actually; I was doing nothing different. But it was also, in fact, my personal best for the number of doubles in a day. They were all chunky carp, - rather rotund, when viewed head on, and I do suspect a touch of "Leney" in the mix, somewhere. The day's best fish - a 14lb 2oz common, surprised us when we weighed it, because we both thought it might only go 12lbs or so - which just goes to show how wrong one can be. The most memorable carp for me, however, was a double figure mirror, which put all the commons to shame when it came to a dogged fight. My arm was actually aching when Dave, great brother that he is, slipped the net under it for me. I caught all my fish off the top - on bread - which pleases me in one respect and disappoints me in another. I have been experimenting with surface techniques and theory more and more in recent times, but I don't want to become a one trick pony. At the close of the afternoon, I switched to sight-bobbed prawns but, having bumped one fish off on the strike, and having lost another due to a hook pull, after two seconds, I realised I was getting tired and that my concentration was waning. It was time to go home. Dave's method was a clever one, and he fully deserved a really good fish. He used a small feeder, with liquidised bread to create a food cloud. The hook-bait was usually bread - crust or flake, popped up, in the midst of that food cloud. For indication he used a quiver tip - an option with his Avon-type rod. He caught four carp this way - to high single figures, and his chance for a really good carp came right at the end, where the quiver tip wrenched round - and he was broken on the strike, despite stout line and a rod with plenty of cushion. There was a huge swirl - almost the size of a round dinner table. It was a very good fish, I think, and it was only bad luck that deprived him of a very memorable capture. However, it was still a most enjoyable fishing session for us both, on a dry, slightly overcast autumnal day; and the experience was made all the more enjoyable by the constant presence of the farm terrier, who is a lovable old soul and, like us, is utterly fascinated by fish. 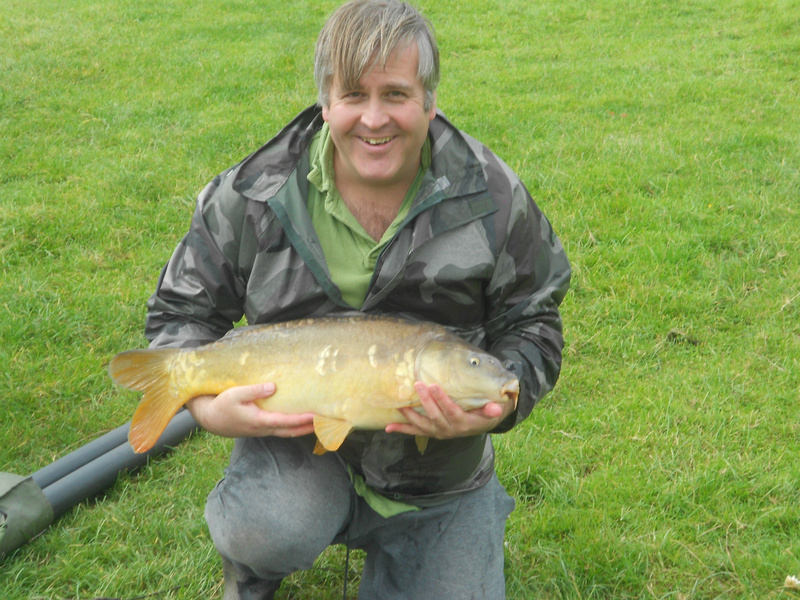 Unfortunately, he runs to the landing nets and actively tries to bite any carp he can find, - so you have to watch him! I must report, for the record, that he failed to sink his fangs into any carp today, thank goodness!